There was a changing of the guard in voice talent for DreamWorks Animation's new take on Mr. Peabody & Sherman, the adaptation of the classic cartoon segment from "The Rocky and Bullwinkle Show," as Robert Downey Jr. was unable to commit to playing the genius dog Peabody and "Modern Family" stat Ty Burrell stepped up to take the role. In addition, Max Charles, who will next be seen as a young Peter Parker in The Amazing Spider-Man, had landed the other titular role of Sherman. Now we have our first look at the stars' animated alter egos in fully rendered, computer animated form, and they look pretty great! 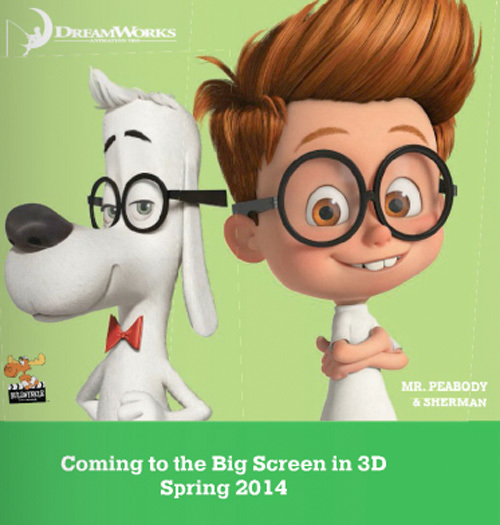 Based on Jay Ward’s classic cartoon, Mr. Peabody & Sherman follows Mr. Peabody (Ty Burrell), the world’s smartest person who just happens to be a dog. When his “pet” boy Sherman (Max Charles) uses their time traveling WABAC machine without permission, events in history spiral out of control. It’s up to this most unexpected of “father-son” teams to somehow put things back on track before the space-time continuum is irreparably destroyed. Rob Minkoff (The Lion King) is set to direct the film from a script he wrote with Jason Clark and Andrew Kurtzman. The DreamWorks Animation film hits theaters on March 21st, 2014. This has got me really excited. Too bad "Sherman" doesn't look like Sherman.